As first card you drew "Knight of Swords". The main meaning of this tarot card is: Disputes and anger. Misplaced aggression. Hitting a sore spot. One’s pure heart. Man with weapons. Restless spirit.. It generally means: Cooling, confrontation and courage. 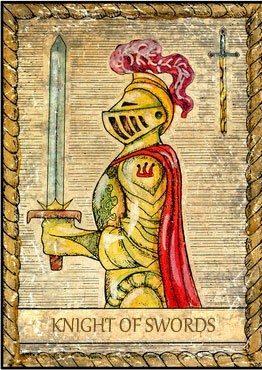 The card "Knight of Swords" also stands for: Skill, defense, hostility, anger, war, destruction, contradictions and resistance. Reversed it points to: Audacity, extravagance. As first card you drew "The Magician". The main meaning of this tarot card is: Having interesting ideas. Clear and balanced forces. Wizard, juggler, charlatan.. It generally means: Will, strength and self-awareness. The card "The Magician" also stands for: Creativity, activity, dexterity, diplomacy, subtlety, self-confidence, illusion, revelation, craftsmanship and suggestion. Reversed it points to: Mental illness, anxiety and loss. As first card you drew "The Moon". The main meaning of this tarot card is: Being afraid, aimless and confused. Feeling something, but being unsure about it. Continuing on the current path.. It generally means: Anger, agitation and delusion. 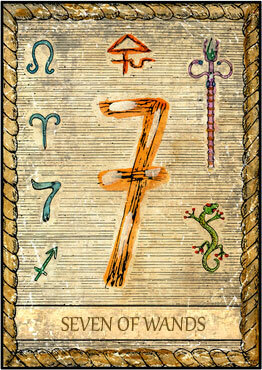 As first card you drew "7 of Wands". The main meaning of this tarot card is: Fighting for a better position. One’s own position prevails. Confronting a conflict. Card of bravery and success.. It generally means: Defense, enforcement and determination. 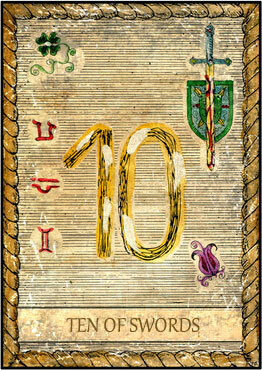 As first card you drew "10 of Swords". 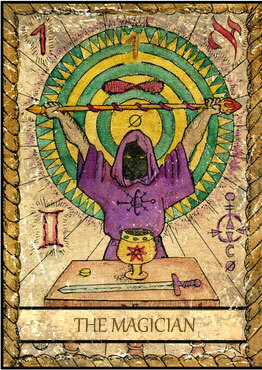 The main meaning of this tarot card is: Draw a final stroke. Change something fundamental. To lay on the floor.. It generally means: End, depression and demolition. 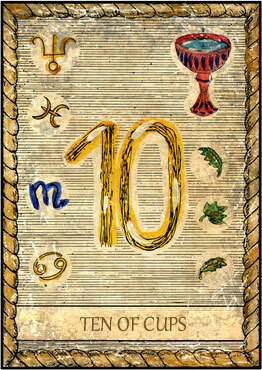 As first card you drew "10 of Cups". 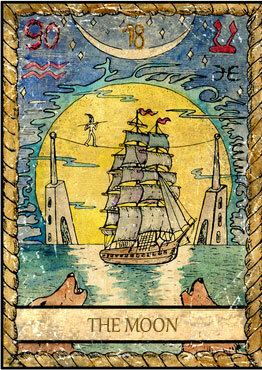 The main meaning of this tarot card is: You reach your destination. It is becoming a hopeful future. Good exit. Human love and friendship. End of hard times.. It generally means: Friendship, family and happiness. As first card you drew "4 of Cups". The main meaning of this tarot card is: Good opportunities are missed or overlooked. Stubborn insistence on something. Finding no consolation. Turning away defiantly.. It generally means: Wasted opportunity, frustration and dissatisfaction. 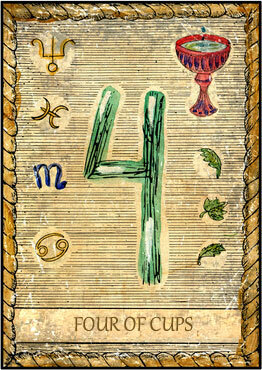 The card "4 of Cups" also stands for: Weariness, disgust, aversion and harassment. Reversed it points to: Defiance, unexpected happiness. Omens. New procedures and relationships.